This two lane inflatable Slip and Slide is 35' long with a landing pool at the end. The misting system built into the overhead tube allows participants unparalleled "slippage". 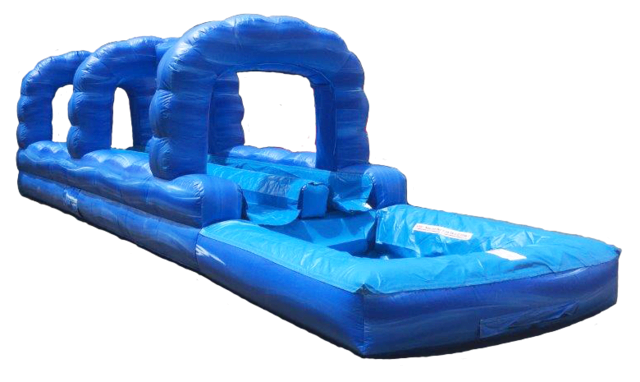 A Super Fun filled activity for all ages and a must have for any summer outdoor event. Requirements: The set-up location must be relatively flat, large enough to accommodate the slip & slide with at least 2 feet on all sides and within 100 feet of a standard electrical power source, able to be connected to a water source via a regular garden hose, and accessible via a minimum of a 3-foot wide space from the driveway/street.